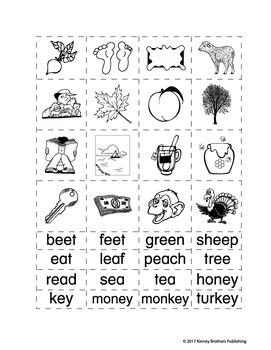 This PDF file includes one set of Silent e (CVCe) Word Charts. 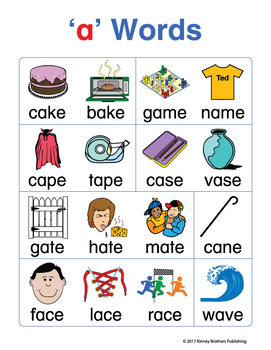 There are 16 words for each each vowel set plus ee-ea-ey words. 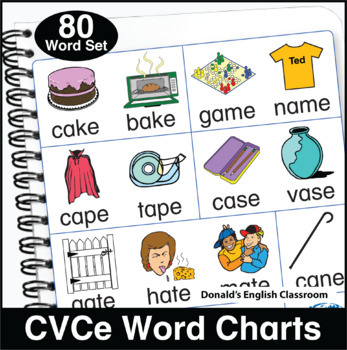 With a vocabulary base of 80 words, the Charts include images with words, images only, words only, and cut-out pages where students can build their own charts and use with interactive notebooks! The charts are in color and black and white. These are the teaching tools you need for introducing, practicing, and assessing students' reading ability. Tacking these charts on a classroom wall or pasting into student notebooks provides a reference they'll return to again and again! These Charts are aligned to Phonics Challenge, Book 2, by Kinney Brothers Publishing. 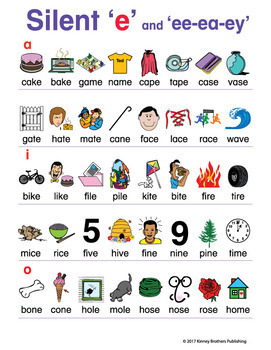 If this set of CVCe words is a bit challenging for your students, take a look at the 48 Word Set! Click on the green star near my logo to follow my TpT store and receive notifications of new product releases, sales, and special deals! Did you know you can get credits to use on any purchase in any TpT store just by leaving feedback? After you've used a product from a TpT seller, please take a minute to return to leave feedback. It's very much appreciated and it's an easy way to earn credits that save you money on your next purchase!